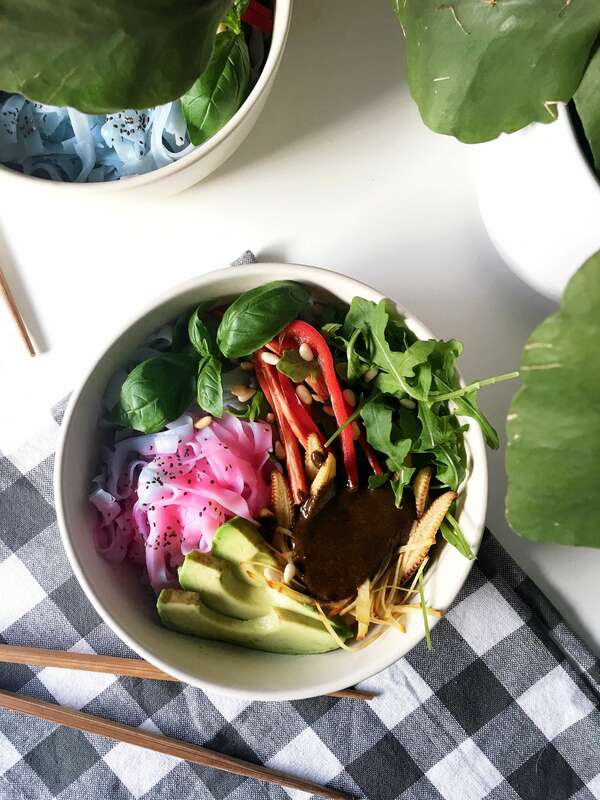 Noodle salads are one of my go to dishes when I want something fast, filling and delicious, all you need is a tasty sauce and some colourful veggies to turn it into a meal! This is definitely a quick and easy recipe. It took me about 3 minutes to whip up the sauce and not much more to chop the veggies, you could all of this while the noodles are soaking and by the time they are done you’ve got yourself a meal. 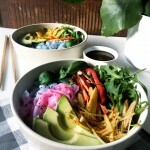 You could possible make this colourful rainbow noodle salad in less than 15 minutes, lets make it a challenge! Just like many people like to dress up during halloween, well be dressing this salad up with a dark satay sauce, made using black tahini, which you can make yourself and you’ll find a little how to by clicking the link. The sauce will turn this once beautiful salad into a messy dark bowl of deliciousness. Of course feel free to play around with the ingredients by using different veggies or a different type of noodle, I used rice noodles which I coloured with purple cabbage to make it blue and being able to transformed to pink with a few drops of lime. You can find out how to make these noodles by clicking on this link. Unicorn noodles aren’t required but its a fun way to turn a regular salad into a Harley Quinn inspired salad, perfect for Halloween! Now lets start cooking! And as usual feel free to leave a comment below or to tag me into your recreations on Instagram. Bon Appetite! To make the sauce simply add everything to a bullet blender and pulse until you get a nice and creamy sauce. If you don't have a blender you can finely chop the chilli and garlic and mix everything in a bowl using a spoon. To assemble the salad add the noodles to a bowl, add the veggies and cover it with the sauce (add as much as you prefer). Enjoy!